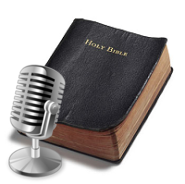 Faith Bible Fellowship provides mp3 downloads of sermons preached from week to week. Listen online, download to your computer, make an audio CD, or listen on your iPod/mp3 player. To Download: Right-click on the Download link and click "Save Target As..." and locate the folder on your computer in which you wish to save the file. Once the download has completed, the mp3 is available for playback. Join Faith Bible Fellowship for expository preaching from God's Word each week. Heaven and Hell: What Does the Bible Say? Justification by Faith or Works? Pray, Pray, and Keep on Praying!